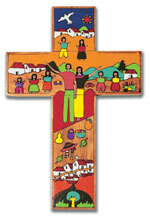 This multicolored wooden cross is a gift from the Salvadoran Lutheran Synod. Salvadoran crosses are traditionally used to tell stories about poverty, war and hunger, and at the same time talk about belief in God and hope for change. The cross will be a feature of worship at the Assembly.